Dr. Mele has again received the Patients’ Choice Award for Most Compassionate Doctor. 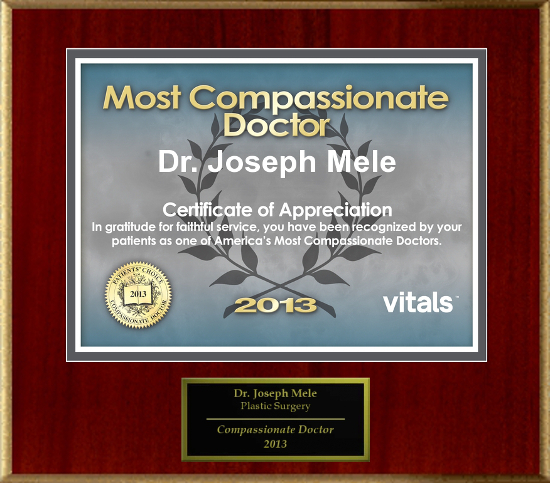 I am humbled to receive the 2013 Most Compassionate Doctor Award from you, my patients. Every year, hundreds of thousands of patients provide feedback about their doctors online. You write about your experience and rate your doctors on several components of care, including: bedside manner, doctor-patient face time, and degree of follow-up. Only a select few receive praise about the compassion that accompanied their care. Vitals Compassionate Doctor Award is part of the Vitals Awards & Recognition Program, where patients rate and review their doctors. Thank you for placing me among the most highly regarded physicians. My goal is to provide the best Cosmetic Plastic Surgery to the San Francisco Bay Area. While great training and Board Certification helps, listening may be the most important part of great results. I thank you for your trust, and I will strive to continue to provide the best plastic surgery results possible.